Use Zipcar as an alternative to the costs and hassles of owning or renting a car. 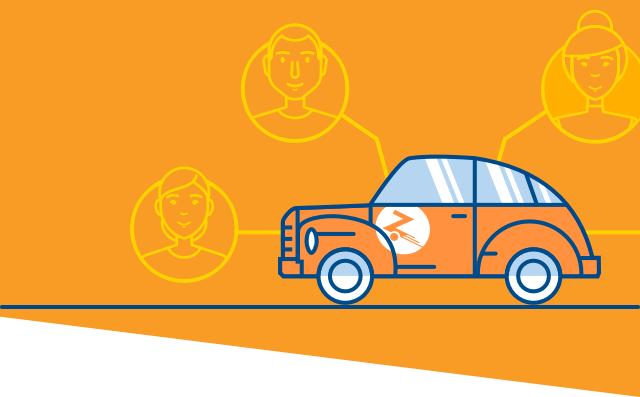 Car sharing is kinda like car rental, but way better. Zipcar covers gas, insurance, parking and maintenance for a potential monthly savings of $600 over car ownership. Zipcars live in cities, airports, and on campuses around the world. Your Zipcard unlocks ‘em all for 24/7 access to clean, comfy rides. View Zipcars near you. Book Zipcars by the hour or day, 24/7. And unlike a car rental, there’s no waiting in line at the counter. Just book, unlock, and go. Imagine a world with one million fewer cars on the road, and cities with more green space than parking lots. We do. 10% of the population is expected to adopt car sharing as their primary mode of transportation by 2025. Every Zipcar takes 13 personally-owned vehicles off the road. A perfect complement to the bus and train, Zipcars help you cart shopping bags, haul furniture, or skip town for a few—on your schedule. Zipcars come in all shapes and sizes—compact sedans, luxury SUVs, spacious vans, and more. Switch it up whenever you feel like it. Lose the payments, keep the car. Save a potential of $600 per month1 with Zipcar. Lose the payments, keep the car. One car, set features, no surprises. Money out of pocket and time out of your day. Filling it up every week really starts to add up. Circle the block or pray to the parking gods. Average spending by owners, including car payment, insurance, gas, parking, and maintenance. Just $7 a month. Pay only for the trips you take. Sedans, SUVs, vans, luxury vehicles, and more. Your trips are covered with our insurance policy. From car washes to oil changes, it’s all covered. Gas is on us—gas cards are in every Zipcar. Every Zipcar has a designated parking spot. With parking, insurance, gas, and maintenance covered, Zipcar members also save a potential of $600 a month over those who own cars in cities. 1 Average costs taken from 2017 AAA Your Driving Costs study and 2012 Colliers Parking Rate Survey. 2 Zipcar monthly costs were calculated using Zipcar reservation averages of 16-32 hours per month. 2 Zipcar monthly costs were calculated using Zipcar reservation averages of 16-32 hours per month, as well as 2013 Zipcar member NTS survey. No matter where or how long you drive, 180 miles are included. Any overage is billed at $.45 (or $.55 for premium cars or vans) per mile. Learn more. All members in good standing have third-party auto liability and Personal Injury Protection (PIP) or "no-fault" coverage. A $1,000 damage fee may apply which you can reduce or eliminate by buying an optional waiver. Learn more.